Beat the Black Friday rush with IK’s Happy Holideals 2017 promotion, which brings you some special discounts on select music software and iOS apps through the end of November. 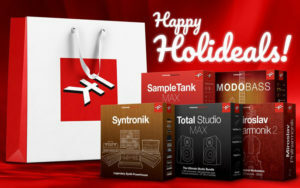 From November 16th through November 30th, 2017 you can save up to 50% off SampleTank 3, SampleTank 3 instrument collections, Syntronik, Syntronik instrument collections, MODO BASS, Miroslav Philharmonik 2 and Total Studio MAX. Plus, get up to 50% off select iOS apps and in-apps like SampleTank, Syntronik for iPad, iGrand Piano for iPhone, iGrand Piano for iPad and iLectric Piano for iPad during this special promotion. When it comes to our iOS virtual instrument like SampleTank 2 and Syntronik for iPad, you get the same amazing power as their Mac/PC software counterpart, giving you astonishing realism and audio quality. SampleTank 2 iOS comes with over 2,300 high-quality instruments with the ability to play up to 8 parts at the same time and an 8-track midi recorder to get your ideas down quickly. 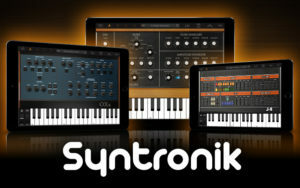 Syntronik for iPad gives you the same 17 amazing synths covering a wide selection from 38 of the most iconic synthesizers and strings machines, and 37 professional effects ranging from dynamic processors to amps, filters, EQs, modulation effects, reverbs and more. iGrand Piano for iPhone and iPad includes 7 pianos with an eighth that can be unlocked when you register your app. 9 additional studio-grade pianos are included in the Piano Expansion Pack 1 and 22 master-quality stereo pianos are included in the Piano Expansion Pack 2 through in-app purchase. iLectric Piano for iPad includes 19 electric pianos, plus an additional 22 pianos available in the Electric Piano Expansion Pack 1. The Electric Piano Expansion Pack 2 adds 22 more instruments to iLectric Piano’s library through in-app purchase. There’s never been a better time to fill up your sound library with some of the most sought after collections and apps IK has to offer. Head over to our IK Online Store and App Store today and take advantage of IK’s Happy Holideals promotion. *All prices from the IK online store exclude taxes and may vary by country. Coupon codes cannot be combined with other offer, promotions or discounts including JamPoints.